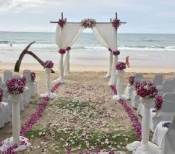 Phuket nightlife is mixed and varied depending on the location in which you choose to party. 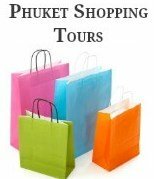 The Island of Phuket is very diverse and so is the nightlife, from night clubs and live music venues and restaurant lounges to pubs, discos, beer bars and go-go bars. For the young party goer’s and the young at heart, the best Phuket nightlife is found in Patong. Patong never fails to attract visitors, take a wander through Soi Bangla and its side streets such as Soi Crocodile, Soi Eric or Soi Easy where you will find the heart of the Phuket nightlife scene. Located within a half kilometre radius of Soi Bangla are hundreds of small beer bars, pubs, gay bars and go go bars, clearly the best destination for night time activity on the Island. Most of the bars and pubs in Patong Beach are small and simple with stools or benches and some kind of roof, all lined up next to each other in long rows. The music can be loud making conversation difficult but fun, giving Patong its unique flavor of a lively and fun place to hang out with an easy and relaxed atmosphere. 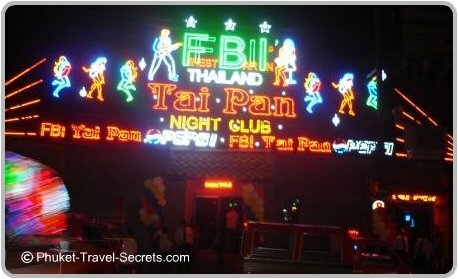 Patong also has several nightclubs and Discos that are worth visiting. For single girls who don't want to be hassled and want some fun head to the Banana Disco, Dragon, Seduction and Tiger Disco which are all located near Soi Bangla. You will also find lots of sports bars that offer visitors the chance to watch a game of football on the large screens. For those who prefer the gay scene, venture over to the Royal Paradise complex where you will find countless bars and discos. While Bangla Road is the heart of the nightlife in Phuket, there are also a number of other areas in Patong that are worth checking out. If you prefer a more relaxing evening and a nice sunset, head to Wassa Homemade Bar. The drinks are cold, the food is good and the views are incredible. In Rat-U-Thit Road you will find up market night clubs, discos, theatre shows, karaoke, sports bars and beer bars. Towards the southern end of Rat-U-Thit Road you will find a variety of restaurants, shops and a fun bazaar called OTOP market. Located within the market area are open air beer bars that are a lot quieter than the bars at Soi Bangla. One of the most popular spectator sports in Thailand is the martial art of Muay Thai boxing, so when you are visiting Phuket why not go and see a Thai boxing match. They are held in specially designed stadiums, you can't miss the stadium in Patong it is located in Rat-U-Thit road. Patong is renowned for some of the best go go bars and Thai girls in Phuket. Its loud and raunchy and you can be assured of a great night out. If your looking for an evening show, Simon Cabaret ladyboy show is an entertaining night out. 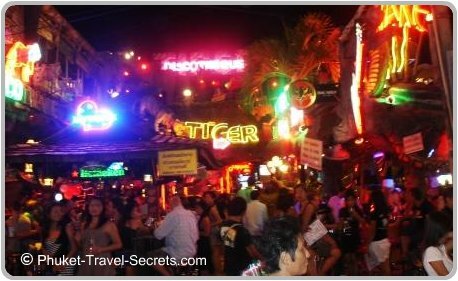 Nightlife in Phuket around Karon is similar to that of Patong, although a lot quieter and on a much smaller scale. The area around Karon Circle is filled with restaurants; you will find beer bars in Luangpohchuin Road which is similar to Soi Bangla in Patong. There are also some quiet bars that are suitable for families like Sanook Sports Bar which has pool tables and darts to keep the kids amused. At the southern end of Karon opposite the Karon Beach Resort is Kata Villa. Kata Villa is ideal for an evening meal, especially if you’re travelling with kids that are fussy eaters. They serve delicious meals and excellent hamburgers that the kids will love. Another great place to go is Angus O’Tool’s Irish Pub, located near the Centara Resort; they have international ales and great food and flat screen TV’s to watch your favourite sport. Kata offers a much more relaxed nightlife and is great for couples or families, with excellent seafood restaurants and cocktail bars. Not to be missed is a visit to Re K'a Ta Beach Club located directly on the beach, or a evening meal at the Ska Bar which is located at the southern end of the beach. If your looking for a romantic evening with incredible views and fabulous food, one of our favourite places is Sabai Corner. There is also a good selection of beer bars and sports bars located in and around Taina and Patak Roads. There is also few beer bars along Patak Road West, behind Club Med. If travelling with children make your way to the Dino Bar; here you can chill out and the kids can play mini golf, a great night for all the family. There is a good variety of nightlife around Bang Tao Beach. Within the luxury five star resorts that occupy the Laguna Complex, there is a range of restaurants and bars. Located next door to the Angsana Laguna Resort is Xana Beach Club. If your looking for other beach clubs there is also a couple of others well worth checking out. Located at Layan Beach at the far northern end of Bangtao Beach is Dream Beach Club or towards the southern end of the beach is Catch Beach Club. Kamala nightlife is relatively quiet, with a few bars and restaurants most are located along Kamala Beach Road. There is also a couple of beach clubs such as Café Del Mar or HQ Beach Lounge. Kamala is home to one of the biggest Phuket nightlife attractions, the Phuket Fantasea Cultural Theme Park. The party going beach clubs and beachfront restaurants at Surin are long gone after the beach clean up in 2016. 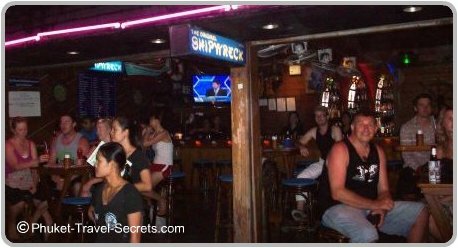 The nightlife in Nai Harn is fairly quiet and spread out, a great place to relax with a nice cocktail or cold beer and watch the sunset is at The Reggae Bar, located next to Nai Harn Lake. There are other bars near the 7- Eleven, Muay Thai Bar, Pukky’s Bar and Rum Jungle. The nightlife in Rawai is very laid back, although you will find lots of restaurants and bars. Not many tourists visit this part of the island after dark, probably due to its location and the cost of transport in Phuket. We found Nikita’s located on the beach at Rawai an excellent place for a cold beer, great food and some of the most relaxing Phuket nightlife. 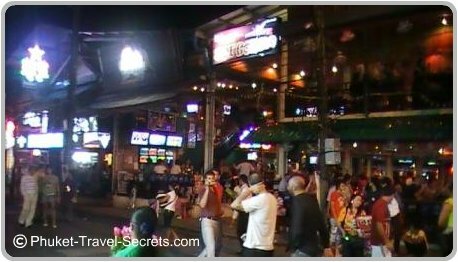 If you are looking for the best Phuket Nightlife and want to party head to Soi Bangla (Bangla Road) Patong.